We know that you have a choice when evaluating companies to help you design and install custom closet and space improvement solutions. 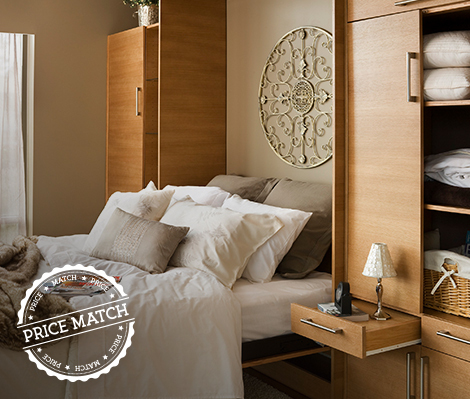 Since we were a pioneer in the custom closet industry in the St. Louis area, we have seen this market change. National franchises have come and gone, individuals have gotten in and gone out of business, and through it all, Beyond Storage has been improving St. Louis spaces for over 30 years. Of course, this increased competition has only made us stronger and increased our desire to be your favorite St. Louis closet company. In light of this, we want to assure you that we won’t be undersold. We guarantee to beat ANY competitor’s lowest price by 5% assuming like materials and design. Plus, unlike our competitors, we provide a blue print of the design for free so you have access to compare with other competitor bid. We guarantee to beat competitors' prices by 5% on like designs and materials. Most importantly, we want to ensure that you get what you want. Our ability to customize solutions to your particular needs is truly what separates Beyond Storage from the competition. If you are considering a custom closet, pantry, laundry room, home office, entertainment center, commercial office, or any custom storage solution, make a point to stop by our showroom and see for yourself how our quality and extensive custom capabilities set us apart. For a Free consultation with one of our expert design specialists, or additional information regarding our competitor price matching, contact us today at 314.997.0150 or fill out our contact form.